Depending on ballast used (including water, sand, steel or combinations), operating weight of the CW16 varies from an 11,464-lb. (5,200 kg) base configuration to an approximate maximum weight of 33,000-lbs. (15,000 kg) for the nine-wheel configuration and 32,850-lbs. (14,900 kg) for the 11-wheel configuration. 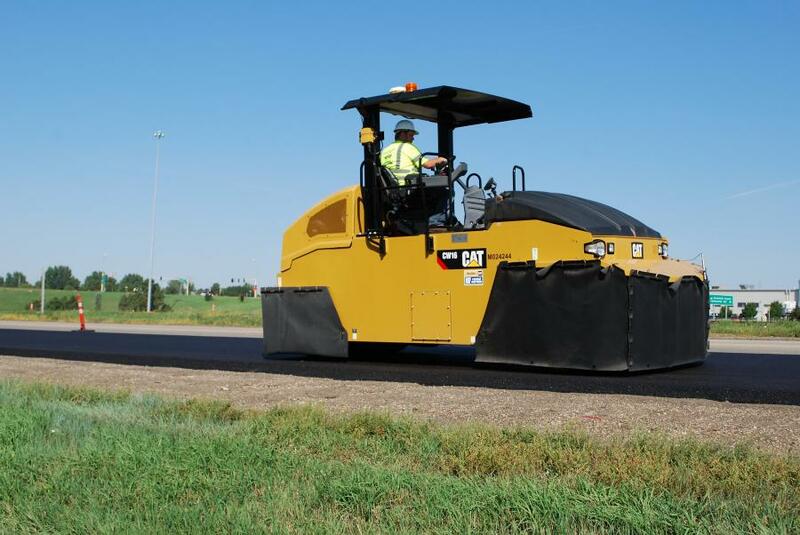 Designed for use on granular materials and all types of asphalt-mix designs, the Cat CW16 pneumatic (rubber-tire) roller is available as a standard nine-wheel model with a 69-in. (175 cm) compaction width or as an optional 11-wheel model with an 84-in. (213 cm) compaction width. The CW16 is designed for efficient performance on highways, city streets, county roads, lane additions, industrial sites, overlays or other mid-size jobs. Depending on ballast used (including water, sand, steel or combinations), operating weight of the CW16 varies from an 11,464-lb. (5,200 kg) base configuration to an approximate maximum weight of 33,000-lbs. (15,000 kg) for the nine-wheel configuration and 32,850-lbs. (14,900 kg) for the 11-wheel configuration. Operating weight can be adjusted to suit job requirements. Per-wheel weight can be varied from 1,280-lbs. (580 kg) to 3,680-lbs. (1,670 kg) for the nine-wheel model and from 1,060-lbs. (480 kg) to 2,975-lbs. (1,350 kg) for the 11-wheel model. Oscillating front wheels assist in compacting soft voids across the entire machine width and the 11-wheel configuration increases efficiency in chip-and-seal applications. A tire overlap of 1.25-in. (3.2 cm) ensures even compaction across the surface. Each wheel is equipped with self-adjusting scrapers and a water-spray system deters material from adhering to the wheel surface. Standard cocoa mats help retain water to keep wheels wet, and heat-retention aprons are available. The CW16's pressurized water-spray system is designed with dedicated spray nozzles for each wheel. The system includes a single water pump, triple filtration, and adjustable intermittent operation. Triple filtration (with filters at the fill point), in conjunction with the design of the water pump and spray nozzles, provides protection against clogs. The adjustable intermittent-spray mode conserves water and reduces the number of refills required, adding to the CW16's efficiency. Two engines are available for the CW16 to meet regional emissions requirements. The Cat C3.4B ACERT engine meets U.S. EPA Tier IV Final/EU Stage IV standards, and the Cat C4.4 meets the equivalent of U.S. EPA Tier III/EU Stage IIIA/China NR III standards. An Eco-mode, in combination with an exclusive automatic speed-control system, is designed to save fuel, lower sound levels, and deliver smooth transitions for optimum mat quality. Both engines are rated at 101.9 hp (75 kW). The CW16's two-speed hydrostatic propel system is electronically controlled and designed to provide both jobsite maneuverability and speeds up to 12 mph (19 kmh). The propel system automatically shifts between speed ranges and has a coast feature that conserves fuel. Tire choices include a 12-ply 7.5 x 15 radial or a 14-ply 7.5 x 15 bias-ply. The CW16 is designed to provide exceptional visibility for the operator, the result of a newly designed console and the machine's standard, rotating operator's station. An LCD display and push-button controls simplify operation for an all-around comfortable operating environment. A ROPS canopy or sun canopy are available. The standard, 500-hour, engine-oil-service interval reduces both routine-maintenance time and overall operating costs. The CW16's large-capacity hydraulic- and engine-cooling systems keep components at optimum temperatures, even in high ambient temperatures, extending service life for such critical components as hydraulic pumps and motors.